We suggest to use Statistical Colour Quality Metrics (SCQM), because this metric gives the most comprehensive information about light source ability to render colours. SCQM takes into account all colours listed in Munsell colour system (1269) and performs sorting of each colour sample in respect to the colour shift vector magnitude and direction in the CIELAB colour space. If the vector length does not exceed the dimension of interpolated MacAdam ellipse multiplied by factor three, then Colour Fidelity Index (CFI) is scored meaning that the colour sample is rendered with high fidelity and a human with statistical properties of vision will not notice the colour shift. 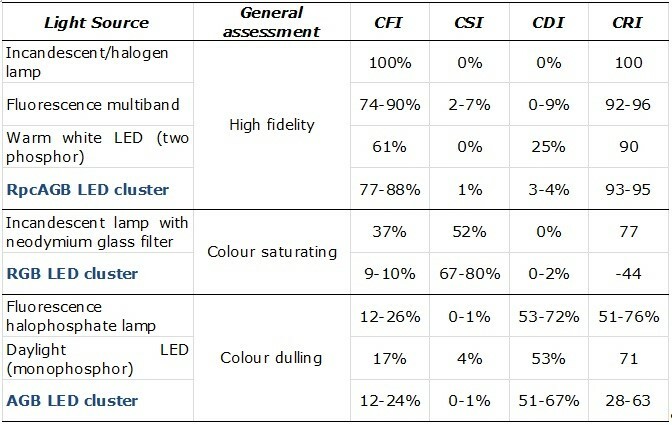 If the colour shift vector exceeds the size of thee MacAdam ellipses and is directed to the increased or decreased chroma and/or to the hue change, then Colour Saturation Index (CSI) or Colour Dulling Index (CDI) and/or Hue Distortion Index (HDI) are scored respectively. In addition, if the lightness of the sample is changed more that by 2%, then Lightness Distortion index is scored. 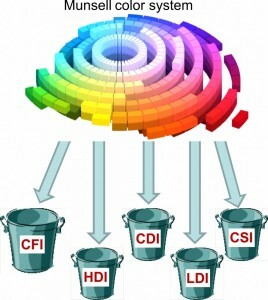 After the sorting of all Munsell samples (1269), the colour rendition indexes are expressed in easy understandable percentage value, meaning that under tested illumination CFI[%] of colours are rendered with high fidelity, CSI[%] of colours are saturated, CDI[%] of colours are dulled, and HDI[%] and LDI[%] of colours have distorted hue and lightness respectively. The most commonly used white light sources can be grouped into three groups namely High fidelity, Colour Saturating and Colour dulling. Please take attention that LED cluster of four initial colours (Red, Amber, Green, Blue – RAGB) can be found in all three groups depending on the partial intensities of each channel and resulting Spectral Power Distribution. Tetrachromatic solid state light source have an ability to saturate or dull colours depending on individual needs. It is extremely important, when representing faded objects. Furthermore objects with saturated colours attract more attention which is very important in retail business. Some objects require dulled illumination for example ecclesiastical and spelaean art. LEDigma light sources allow changing the colour saturation-dulling ratio with wireless software control – it is enough to take smart mobile device (smartphone or tab) or PC and setup lighting parameters by pushing a few buttons. Example bellow illustrates how the appearance of the fruit scene can be changed (be aware that the camera and computer monitor is capable to reproduce all colours in a right way). Light sources with high colour rendition index Ra or with high colour fidelity index CFI are not always the most desired by the humans. Research shows, that people prefer a little bit saturated lighting in compare with natural illumination. More than 250 subjects were asked to adjust saturation-duling factor of a tetrachromatic LED cluster (colour rendition engine) in order to perform a trade-off between colour saturation and colour dulling effects. As an object was presented several paintings, one of them is shoved above – colourful painting with dominant fire theme. The results showed that the average preference was given to somewhat saturating lighting rather than to high-fidelity colour rendition. Similar settings of proffered illumination were observed for other scenes (fruits, paintings) also. With LEDigma luminaires now it is possible set illumination with highest visual satisfaction for individual user or statistical average of users. Objects, especially artworks, under inappropriate illumination change colour gamut due to the photochemical damage. Until now the restoration of the paintings and other aged artworks was the only way to restore colours and entire colour gamut. Our tuneable illumination technology allows for precise and mathematically proven shift of colour gamut in order to obtain the desired result. For example the paintings with aged and yellowed varnish can be restored in real time by shifting the gamut towards the bluish region of the colour space. Below it is shown the colour gamut shift for the brownish picture in the CIELAB colour space. Each point represent the pixel of the painting recorded by the imaging colour photometer. The illumination systems offered by LEDigma have precisely defined spectra and damage index for most popular illumination objects (cellulose paper, rag paper, paint on canvas, textiles and etc.). The luminaries are allowed to change the colour rendition properties, colour temperature value and hue correction parameter with photochemical potential fixed in order to prevent the objects of unintentional damage. For example the LEDigma light sources can be optimized to have photochemical potential up to 10 times lower that filtered halogen light (now widely used in museums) for specific very sensitive objects.